The Georgia High School State Playoffs get underway this week with seven DeKalb teams preparing for first round contests in their respective classifications. Coach Jermaine Smith’s No. 2 ranked and two-time Region 5-3A champs Cedar Grove Saints (9-1) open by hosting Region 8 No. 4 seed Hart County (4-6) on Friday at Avondale Stadium in the first round of the Class 3A state playoffs at 7:30 pm. Cedar Grove won the 2016 Class 3A state title and has reached the state semifinals three consecutive years while compiling a 37-5-1 overall record which goes to 46-6-1 with this year’s 9-1 record. The Saints are 25-1 in region play during the past four seasons including a streak of 18 consecutive wins since a loss to Westminster in 2016. Hart County is facing Cedar Grove for the first time ever and the Saints are looking to capture the program’s 300th victory (299-193-4) when they take the field on Friday. Junior running back Chavon Wright has returned from injury and had a pair of touchdowns in the Saints final regular season game (71-0 over Stone Mountain). Wright is one of several banged up Saints who have returned to the lineup as the Saints prepare for another playoff run. The offense has a two-headed quarterback attack in senior Kendall Boney and sophomore Austin Smith who have combined for over 1,500 yards passing and 26 touchdowns on the season and another 373 yards rushing and 7 touchdowns. Senior Robert Jones has been the leading rusher with 700 yards and 7 touchdowns on the season and freshman Rashad Dubinion has over 300 yards and 3 touchdowns. All-State receiver Jadon Haselwood has over 600 yards receiving and 7 touchdowns while added several scores on special teams and defense. Rashad Jordan makes a good tandem with Haselwood adding 500 yards and 10 touchdowns. The Saints defense is led by senior defensive lineman Dante Walker and Rashad Cheney who have combined for 21 tackles for a loss and 9.5 sacks. Junior defensive end Alvin Williams has 6.5 tackles for a loss and 3 sacks to go with senior linebacker William Jenkins who has 63 tackles including 7.5 for a loss. Hart County is coming off a tough 35-34 overtime loss to Morgan County that dropped the Bulldogs to the No. 4 seed. The No. 4 ranked Stephenson Jaguars and No. 9 ranked Tucker Tigers both play host in their first round Class 6A state playoff games on Friday. Region 4-6A champ Stephenson (9-1) takes on Region 1 No. 4 seed Coffee (7-3) in a 7:30 pm game at Hallford Stadium on Friday. The Jaguars are coming off a big 30-24 win over Tucker to claim the program’s ninth region title and first since 2015. The face the 2017 Class 6A runner-up in Coffee who comes in off a 38-7 loss to No. 1 Lee County and has lost three of their last four games. Stephenson and Coffee are meeting for the third time in the playoffs having split the first two meetings Stephenson upset Coffee 17-7 in the 2006 Sweet 16 and Coffee returned the favor in 2008 with a 17-14 upset win in the first round. 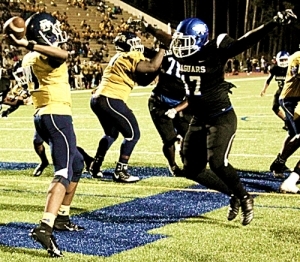 Stephenson is making its 19th consecutive playoff appearance. The Jaguars are led by a trio of running backs in Jevon Goff, Ryan Ingram and Donovan Moorer who have combined for over 1,700 yards and 25 touchdowns on the season. Senior defensive lineman Jamal Andrews has 68 tackles (11 for loss, 4 sacks), senior linebacker Tra’ Wilkins has 67 tackles (9 for a loss and 4 sacks) and junior defensive end Janirr Wade has 47 tackles (10 for loss and 3 sacks). Tucker (7-3) plays host to No. 5 ranked Northside of Warner Robins (5-5) at 7:30 pm on Friday at Adams Stadium. The two teams are meeting for the sixth time in the state playoffs with Tucker holding a 3-2 edge. 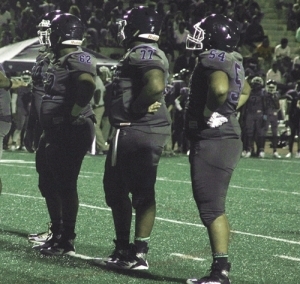 This is the third consecutive season for the two to play with Tucker having won 22-7 in the semifinals in 2016 and 28-7 a year ago in a quarterfinal match. Northside won the first meeting with a big comeback win 31-28 in the 2007 semifinals and also won 23-20 in 2012 with another last minute win. Tucker won 17-16 in 2011 on a 100-yard fumble return in the final minute. DeKalb has four entries in the Class 5A state playoffs led by No. 7 ranked Southwest DeKalb along with Arabia Mountain, Lithonia and Miller Grove. 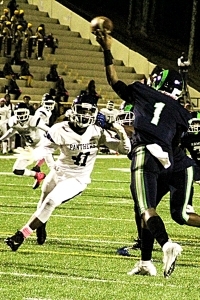 Southwest DeKalb (10-0) enjoyed its eighth undefeated regular season in school history and first since 1999 with a 13-6 win over rival Columbia last weekend and head into the playoffs to host Loganville (4-6) in a 7:30 pm contest on Friday at Godfrey Stadium. The Panthers are making a third consecutive appearance in the state playoffs and are vying to advance past last year’s second round appearance. Coach Damien Wimes is 18-4 in his two years at helm of his alma mater and helped collect the school’s first region title since 2009 and 17th overall. Arabia Mountain (6-4) is also making a third consecutive state playoff appearance under Coach Stanley Pritchett as the Rams will play host to Region 8 No. 3 seed Clarke Central (6-4) in a 7:30 pm contest on Saturday (Nov. 10) at Godfrey Stadium. The Rams advanced as the No. 2 seed following a 37-0 shutout of region foe Lithonia last weekend. Arabia Mountain has advanced to the Sweet 16 the past two seasons. Lithonia (6-4) goes on the road as the No. 3 seed traveling to Cedar Shoals (7-3) on Friday for the 7:30 kickoff. It is the Bulldogs first playoff since the 2016 season and its first head-to-head matchup with Cedar Shoals.